Some could argue this 1972 Triumph T100C is the last of the line. Let’s flashback to 1937. Triumph designer Edward Turner pens the 498cc parallel twin-cylinder engine that fits into the Speed Twin. The Speed Twin was something of a seminal motorcycle, as its engine influenced Britain’s entire motorcycle industry. Other makers — including B.S.A., Norton and Royal Enfield – all developed and produced their own parallel twin engines after witnessing the success of the Triumph. But Turner could not have known when he drew the Speed Twin engine that its basic design would still be powering Triumph’s own motorcycles nearly 40 years later. From its introduction in 1937 right up to its end in 1973, the 500cc parallel twin changed very little. Obviously modifications were made over time, including a change from a separate gearbox/crankcase layout to unit construction, but the successful basic details laid out by Turner were never much improved. For example, Triumph’s twin-cylinder engine included a vertically split crankcase that houses a single, central flywheel. The crankpins are “in line”, allowing both pistons to rise and fall simultaneously. The cylinders fire alternately with power impulses spaced evenly at 360 degrees. By the early 1970s Triumph was a foundering motorcycle company. The British manufacturer had in 1971 introduced its oil-in-frame models for the 650cc engine. Critics of the oil-in-frame design derided it for being too tall, and for changing the pleasing proportions of the earlier duplex tube frame models. Triumph had, however, left the smaller 490cc engine in a standard duplex frame. This meant the half-litre Triumph’s had a much lower seat height and more traditional looks, and were offered as two models for both 1971 and 1972 – the T100R Daytona and the T100C Trophy. The Daytona model was equipped for the road, with dual AMAL Concentric carburetors and a low-level exhaust system. The T100C featured a single AMAL Concentric carburetor and a stylish high-level twin-pipe exhaust exiting on the left, with a chrome wire shield to protect wayward legs from burns. Wheels were shod with knobby-style tires, and the handlebars are a little wider than those found on the Daytona. The T100C wasn’t the first ‘off-road’ machine Triumph produced. In the 1950s Triumph built models with true off-road capabilities, including the TR5 and the TR6. Both were quite capable performers in various events, including trials in the U.K. and desert racing in the western United States. But by 1972 the Triumph T100C would be considered more of an enduro-style machine, with little real off-road prowess. Helping lighten the memory are his two British motorcycles. Besides the T100C Nicholson owns a 1970 T120 Bonneville, and for serious road riding there resides in the garage a 2003 Anniversary Edition Harley-Davidson Softail Deuce. Nicholson lives near Bragg Creek in Alberta, where on weekends Calgary motorcyclists tend to congregate in the town centre. On good days, there can be upwards of 150 motorcycles on the asphalt parking lot of the main mall. That’s where Nicholson first saw the T100C. 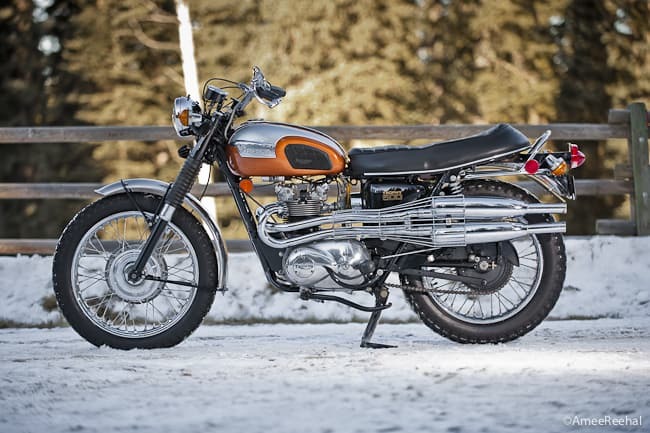 The first owner had purchased the motorcycle through Robin’s Classic and Vintage Motorcycles (www.robinsclassicmotorcycles.ocm) on Vancouver Island, where noted Brit-bike enthusiast Ken Brown had restored the machine. A year later when he answered an advertisement in the local Bargain Finder classified paper offering a Triumph T100C he wondered if it might be the same motorcycle he had spied in Bragg Creek. Indeed it was, and needless to say Nicholson bought the bike. Since purchasing the T100C Nicholson says he’s had to very little, apart from some minor detailing and polishing and regular maintenance chores. He doesn’t travel great distances on the 500cc Triumph, but he will ride it into Calgary (a distance of some 90 km round trip), or, he will venture a little further from Bragg Creek to the next small town of Cochrane to the north. By 1973 the end of the 500cc Triumph range was the T100R road going model and the TR5T Trophy Trail, or the Adventurer. Replacing the T100C, the Adventurer was made up of components from both B.S.A. and Triumph parts bins. A B.S.A. scrambler-type frame formed the chassis of the TR5T around Triumph’s 500cc twin engine, and the Triumph conical-style front wheel and forks were up front. But the TR5T was a one-year only model; in 1974 Triumph dropped all 500cc machines to focus on the larger 650 and 750cc motorcycles, where more of a profit could be made.